With our thousands of fabrics that facilitate one-of-a-kind results, we like to say we’ve never produced the same design twice. Yet all our projects share one thing: customers who just love the end result. Here are some of their stories. "Your staff was very helpful and spent hours helping me. 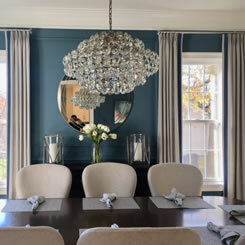 They were very warm and gracious and shared my enthusiasm for decorating. I never dreamed that I would be able to pull together fabrics and designs to create the desired effect." 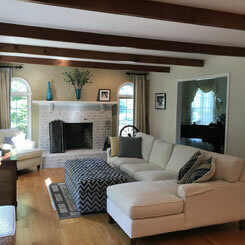 "Your staff worked with me extensively planning the new furniture for my family room. They were cheerful, professional, helpful and went out of their way to help me! I love Calico Corners and will definitely shop here again for furniture. Thank you." 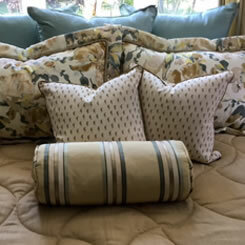 "The sales associate was knowledgeable and had a great eye for combining colors and fabrics. Her upbeat attitude made her a pleasure to deal with." "I went to the store looking for fabric to recover my dining room chairs. I'm not experienced and needed help. Your staff helped me through the process very successfully. They were extremely friendly, helpful and knowledgeable. Thank you!" "I came to your store after visiting two other fabric stores to match lavender and purple for my bedroom. Your staff was wonderful pulling many different selections together. I felt like I was shopping at Nordstrom's. I still couldn't decide so I went home and rethought my colors after seeing a different color scheme. I plan to return tomorrow and buy the fabrics from the new color scheme. I am so excited and thankful!!" "It has always been a good experience when using the talented staff at Calico Corners for over thirty years. When I walked in today at Saratoga, I was delighted in the store's inventory and excellent displays." "I'm writing to express my deep appreciation for the help I received from your staff at my first visit to your store. They were extremely helpful, knowledgeable, patient, understanding, professional, and kind to me while I shopped at your Torrance location. Rarely do I find help with such sincere efforts and smiles. Just amazing and I look forward to returning to your store again." "Your staff is absolutely great. I ended up with gorgeous fabric and will have my furniture for the holidays. It was a great experience." "We have not redecorated in 18 years. This is my husband's birthday present. He felt we needed professional advice and we sure got it. Your staff spent hours with us and we both got exactly what we wanted. We can't wait to do more rooms. Thank you. We couldn't have asked for more." "You have a wonderful staff that I have worked with for several years and that is the reason I continue to return. They are extremely knowledgeable, very dedicated and go above and beyond to meet my decorating needs. Truly a rare find in these times". "The service and quality of the work is just great!" "I had the most wonderful experience working with Calico Corners. The sales associate was very creative and I left with a combination of fabrics and accessories I never would have put together by myself. She also went beyond the call of duty when she had to special order more trim and it was delivered in two days. Thank you." "Love the staff! My daughter's room is amazingly beautiful. She has a design center room but not the design center price tag!" 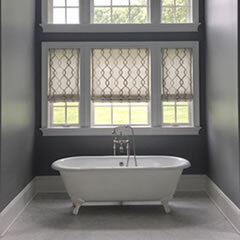 "I went to Calico Corners for cornice boards for my kitchen but eventually chose valances due to your staff's suggestions. They made my shopping experience easy and pleasant. 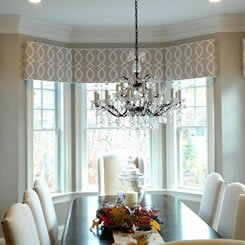 I also ordered Roman shades for my French doors because of the beautiful samples your staff showed me. They explained everything so clearly and professionally." "I am thrilled with my purchases from Calico Corners. 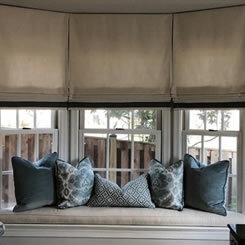 Your staff helped me select fabric for cornices in four rooms plus a window seat cushion. I am a novice when it comes to colors and they were so patient with me and spent hours helping me make my selections. 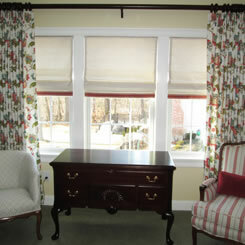 They also helped me coordinate bedding and shams to match my cornices." "The staff was very thorough, helpful and easy to work with." "I have had ready-shades on my windows for 3 years. I came into your store ready to shop. 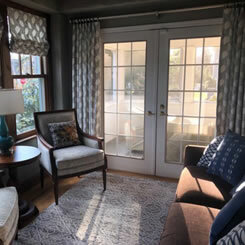 I needed window treatments for my entire first floor. My biggest problem was getting started and the staff understood the look and feel I wanted. There were lots of choices and they helped me narrow it down. What started out as a chore became fun and exciting. You have a very happy customer!" 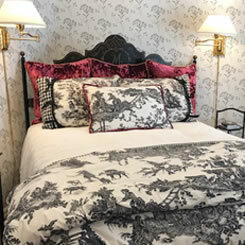 "Your staff was wonderful guiding me through my selection of coordinating fabrics for a duvet cover, trim, bedskirt and pillows. They were thorough, polite, helpful and great to work with. My bedroom looks terrific and I was delighted from start to finish. I will be back for window treatments." "Loved working with your staff who were very helpful and understood perfectly what we wanted. We now have a gorgeous family room! "I have been a Calico Corners customer for the past several years and the reason is simple. Your staff is amazing! I decorate one piece at a time and sometimes one pillow at a time. Your staff is warm, patient and knowledgeable." "The entire staff is outstanding!! I would definitely recommend your store to friends." 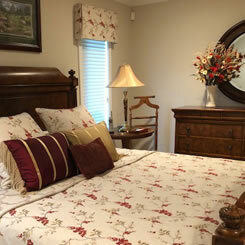 "Your staff was so helpful and very sweet. On the first visit I went home with swatches and then made my decision. They were a big help!" 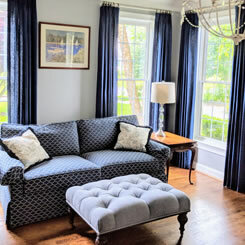 "Your staff was so helpful, they helped me choose a sofa, loveseat and drapery fabric that was beautiful. All salespeople should be so skillful. Wonderful!" "Your staff was excellent, patient, knowledgeable, and extremely helpful. We were most grateful for their help. Well trained! Keep up the good work. We love your store!" 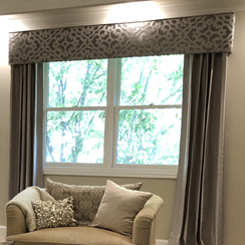 "We used your in-home consultation service and after an excellent presentation, we chose fabrics for windows, a sofa, chairs, ottomans and a rocker. She made us feel very comfortable and we shared ideas. I'm very happy and so is my husband." "I have been in and out of this store many times over the years. This most recent need was for reupholstery of two chairs. The staff went out of their way to get the fabric I wanted. They are gems!" "It is an extreme pleasure to work with your staff who are organized, talented, incredibly creative, knowledgeable with textile design and people and deserve tremendous recognition. I have worked with designers in the past and have never written such a note. Soon my house measurements will be scheduled and my choices finalized. In the meantime, I sincerely look forward to my home decor." 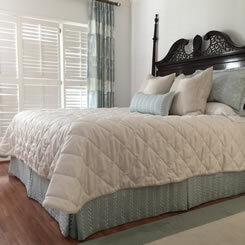 "The sales associate was very helpful and creative in designing my duvet cover and shams." "Love the store. As a designer I use it all the time. The staff is most friendly and helpful." "I have been visiting and shopping Calico Corners in San Antonio for years. Your staff is so helpful, smart and talented. 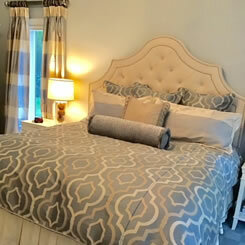 They helped me select, order and own a gorgeous custom, reversible bedspread and boxed shams. They are hard working, creative and patient." "Our two rattan sofas look and feel fabulous! The sales associates were great. Excellent, prompt, knowledgeable service and good, clear communication on the status of our upholstery order!" "Your staff was so incredibly helpful! I thought we would just "look" but because of your knowledgeable staff, we bought fabric for eight chairs and sheer curtains! A lovely experience." "This store has the greatest customer service I've ever received. The associates are very helpful and friendly. I felt like I was sitting on a throne by the way I was treated. Thank you for such great service!!" "I am so impressed with your staff. They helped me put together my living room sofa and two chairs. They were patient, caring and had great style!" "I just have to tell you that I met the most amazing associate, Beth. She was so incredibly helpful, so passionate and all around so much fun to work with, and she was very knowledgeable. We had a great time! 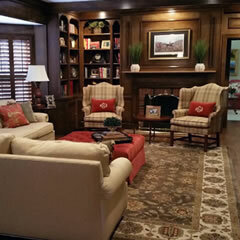 Testimonial:"Thanks so much to Nancy for her guidance with our TV room! Her ideas were extremely creative, and she was very patient during the entire process. She was an absolute pleasure to work with!" Testimonial:"We were very pleased that we selected Calico to help us design, and to provide the furnishings for our new home. 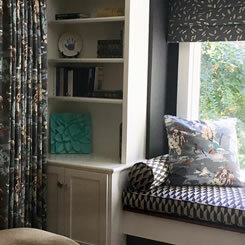 Alison spent many hours with us…providing her knowledge and design expertise on both fabrics and furniture. She really listened to our needs and desires and pulled together excellent fabric choices for us to choose from. She was delightful to work with. When we felt we needed to make a slight change (after the fact) to something we ordered, Calico worked with us in a fair and equitable way to reach a solution that satisfied everyone." 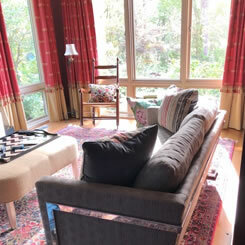 Testimonial:"Lois Lampman helped us select furniture in the perfect style, fabrics and colors for our new living room. We appreciate that she was prepared, worked efficiently and within our budget." 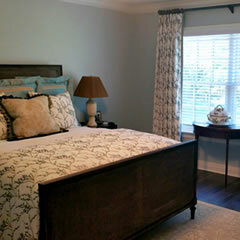 Testimonial:"Alison had great ideas and was very flexible in helping me re-do several rooms in my home. She has a lot of experience and it shows. I would use her again in a minute." 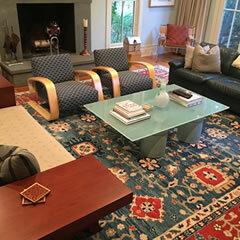 Testimonial: "Calico Corners in Mount Kisco was great to work with! Bonnie was prompt, professional and lovely to work with!" Testimonial: "From start to finish, my experience working with Maria Canning in the Mt. Kisco location was great. Maria helped to guide me through the process, and with her knowledge and expertise, the end result was a success!" 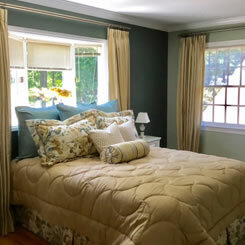 Testimonial: "Calico Corners did window treatments/upholstery for my remodeled kitchen, master bedroom/bath and den. Sue McGrath was our design consultant on all 3 projects. It was a pleasure working with her. She made everything easy and had great ideas." Testimonial: "Ann and all of the workers at Calico (especially Richard) were very professional from day one...until all their work was complete. We highly recommend them for your home as well. The project came out stunningly!" Testimonial: "This was a very pleasant experience from start to finish. My designer (Sherry) was very knowledgeable and has an amazing eye. She absolutely captured what I wanted. The install was very quick and flawless. Highly recommend! " 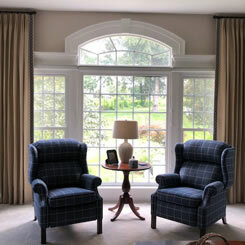 Testimonial: "We are thrilled with our new window treatments and pillows. Vicki has an incredible eye and was quickly able to find beautiful fabrics that fit our style and taste. 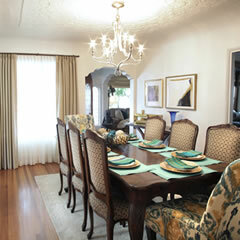 This is our second time working with her and she's transformed every room she's touched!" Testimonial: "I have known and worked with Ann for 15 (plus) years. She knows changing trends and also her clients' needs and wants. She listens and executes perfectly. We could not be happier that she knew what we would be comfortable with and love!" Testimonial:"My experience with Emily and Calico Corners was wonderful from beginning to end. 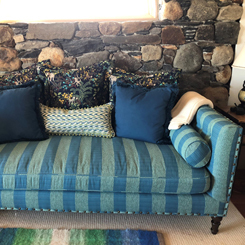 Emily was able to find fabrics so I was able to refresh the look of our sitting room without having to purchase any new furniture. 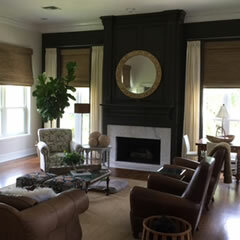 The pillows and drapery panels were even used in my new home! Emily has a knack for making your thoughts a reality. Thank you for all of the beautiful décor you have provided to our homes." Testimonial:"I think you're awesome and that Calico is awesome too. Let's face it, there is a little bit of you and Calico in EVERY room of my house." 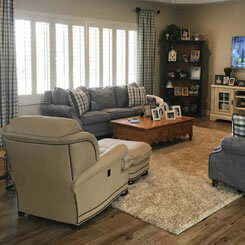 Testimonial:"Calico through their Lead Designer, Gayle Teti, has given us excellent service and award winning results in their decorating of several of our most recent model homes." 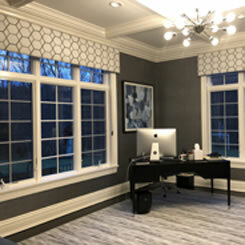 Photo courtesy of Bentley Homes -- new luxury homes in Chester and Delaware County, PA.
Testimonial: "I had a fairly well-defined idea of the window treatments I wanted, but counsel from the Calico designers with regard to fabric and design choices really helped. It resulted in a finished product far exceeding what I could have achieved on my own. 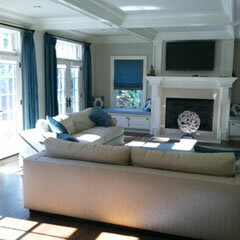 I could not be happier and look forward to working with them again on my next home decorating project." 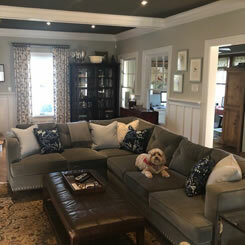 Testimonial: "I sent Tony some initial photos of my 'before' space and he brought the most perfect fabric selections to my house for our consultation. We immediately were on the same page. He is fabulous!" 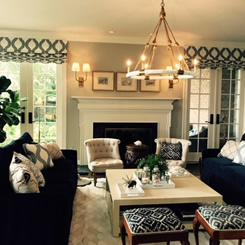 Testimonial: "Vicki Keros, Inc. is a design firm in the Pasadena area. 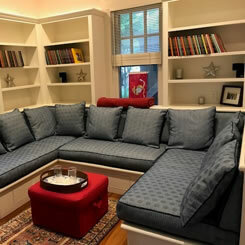 Our clients with time restraints especially love the convenience of Calico Corners as a one-stop shop! If you want to create the look of your dreams, Calico is the place to go. From their wide assortment of fabrics and trims that are impeccably displayed, to the expertise of their design consultants, it is the place to go for any project from start to finish. Their furniture line can be customized from top to bottom and their craftsmen can execute every last detail perfectly." 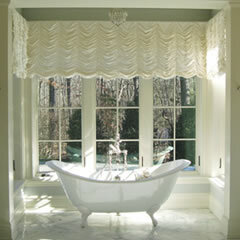 Testimonial: "I really like how the bathroom turned out. Thanks!" Testimonial: "Vicki Feeley was a pleasure to work with. Professional, patient, flexible, with a great eye for color combination and décor made her a great partner to work with. Vicki was very pleasant and went beyond our expectations and made our life easy. We have recommended her to a bunch of friends and would definitely work with her again. A heartfelt thank you! 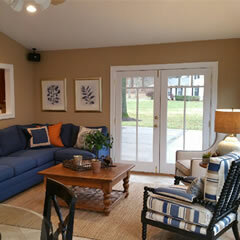 Mita & Hitesh S."
Testimonial: "We are so happy with the way our family room turned out. Kim completely understands our style and works so hard to make sure we are happy. Over and over again, she helped turn our home into the comfortable living space we want it to be." Testimonial: "Tanisha, my designer for the past two and one-half years, has been a lifesaver in so many ways. She has guided me through each room in my home and in my vacation home as well. She has listened to every idea and is the best in the industry! I love this designer and I wouldn't use anyone except Tanisha!" 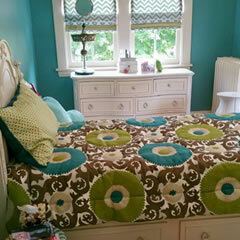 Testimonial: "Calico is the first place I always go for my decorating needs. I can always find such unique and rich fabrics. Thank you Calico!!" 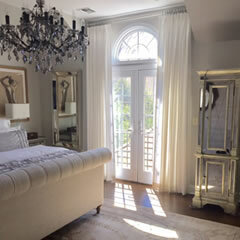 Testimonial: "I am thrilled with the window treatments in my master bedroom and bath. It was exactly what I wanted and looks amazing. The fabric is stunning. Lisa is wonderful and it is a pleasure working with her. She made sure to please from start to finish!" 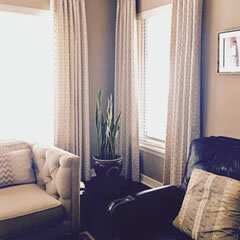 Testimonial: "Kimberly is a master at putting fabrics together. I enjoyed her passion, enthusiasm and bubbly personality. 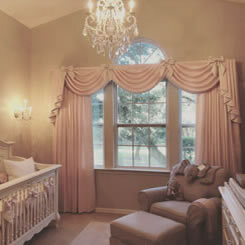 She is honest and straight-forward about what a room needs, with a wealth of ideas to accomplish the goal." Testimonial: "My husband and I bought the perfect remodeled home for us. We needed all new furnishings and Calico Corners had everything that we needed. I am so grateful to have Kimberly Scails' expert design skills. She made our experience so delightful and amazingly easy. She is an incredible design consultant who immediately understood and formulated the look and needs that we wanted for our new home. Not only was she accommodating but innovated to present several options. She enhanced my experience and broadened my initial perspective. With all of her hard work and incredible efforts, she made our "furnish an entire home" experience both easy and fun. I felt that I not only made a design connection but a dear friend. I continually recommend her services and sing her praises. She's a true gem! Calico is very lucky to have her." Testimonial: "Working with Lisa Sisco has made our move into our new home so much easier - there's a great balance between taking our feedback into account and also encouraging us to try new things. The result is better than we could have hoped for. We will continue to work with Calico on a number of additional projects!" Testimonial:"I am beyond THRILLED with my experience with Calico. I loved the Robert Allen fabric Kyla helped me select for my chairs. The upholsterer did such a fast and superbly skilled job. I am a very happy customer. I will recommend you to all my friends. Thanks again!" Testimonial:"It has been an absolute pleasure working with Carolyn Shultz at Calico Corners in Overland Park. Carolyn picked up on my style immediately and made gorgeous choices for my new home project. She has made every room far better than I could have imagined." 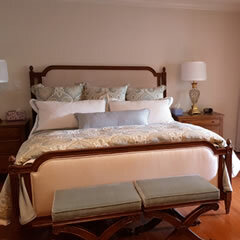 Testimonial: "I love the simplicity and calmness that I feel when I walk into my lovely bedroom. 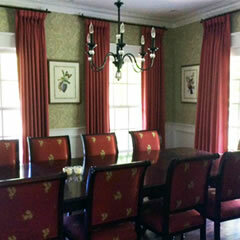 Tatyana made a wonderful choice of fabric and trim, and I plan to use again in my future projects." 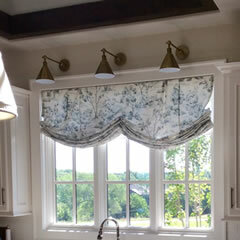 Testimonial: "Calico's window treatments added a style of pure beauty to my kitchen. The help I received from Joyce was far beyond what was expected. She was amazing and knew exactly what I envisioned. Thank you!"